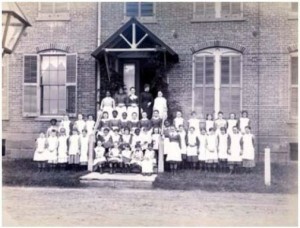 In 1874 Superintendent S. N. Rockwell and his wife were in their first year of running the Long Lane Industrial School for Girls. They had come from New York’s House of Refuge, a pioneering reformatory for children. Originally, Long Lane was privately incorporated. “Wayward children” between the ages of 8 and 16 were sent to the school on complaints filed in any court. The State exercised its in loco parentis powers in committing each girl, and it subsidized their placements. The founders and directors thought that the best place for the girls was on a country farm far away from what they believed was crime, filth, and degradation of the city. At Long Lane, the Superintendent, teachers, and House Matrons provided an extremely structured day with a regular schedule. Children resided in the Pratt or Street Homes, named after wealthy benefactors. They received hearty doses of Christian moral instruction, schooling, and training as housewives. They also worked in a box factory, whose sales supplemented state funds and private donations for many years. The bylaws of the school directed the Superintendent to keep a journal of the most memorable events of each day. Rockwell was the first one to do so. The Superintendent’s Journal is one of several records that the State Archives is acquiring from the current Long Lane. The entries below remain faithful to the original spelling and punctuation. A day of cloudless skies, soft – misty atmosphere and almost summer warmth. The girls have had a happy day. Dinner of chick pie, sweet potatoes, turnips onions and potatoes, cranberries, “cold slaw,” doughnuts, dumplings and squash pie, finished by a supply of nuts and candies for which we are indebted to the kindness of Messrs. [ ] and [ ] & Gardner. The mildness of the day made it safe to spend an hour or two in the playgrounds after dinner, which was much enjoyed. At five o’clock all assembled in the Chapel, when an entertainment prepared by the girls under direction of the teachers was given. Eight very effective tableaux were rendered, and a little play called ‘The Mystery of Muddlersity (? )’ was enacted by seven of the older girls. These being interspersed with singing by the school, and some very fine solos by Miss Martin, soprano of the Baptist Ch. [urch] choir, made over two hours pass swiftly away. At 20 min[utes] past 7 all joined in the evening devotions and the girls retired at the usual hour, 8 P.M. We expected visits from resident trustees but were disappointed – and besides nuts and candies above mentioned no donations were received. All on the premises have been very busy in preparations for the celebration of this day for a week past, in every interval from regular duty in the usual routine. Many very liberal donations have been sent in from citizens of Middletown, also from Hartford and Wallingford. An abundant dinner of roast – turkey with vegetables, and dessert of mince pie & cakes was provided, and enjoyed by the girls as only children can enjoy such food. Dinner at – 2 PM. – recreations, games & etc., until 5 PM when they went to rooms for an hour. At six all repaired to the chapel which was tastefully decorated with mottoes, emblems and garlands in evergreens. Two Christmas trees reaching the ceiling, were loaded with gifts provided by friends of the school. One held those designed for the Pratt Home, and the other those for the Street Home. After singing a Christmas Hymn, the girls were addressed by Mr. Conner of the Wesleyan University and listened to his remarks with great attention and pleasure. Another song was followed by an address from the Hon. Samuel J. Starr, which was received with delight by all present. Mr. H. Vassem of Wallingford afterwards spoke to them in a very interesting manner. A number of songs and select readings by the girls followed, interrupted once by a recess of 15 minutes for general conversation which was enjoyed by all, both visitors and girls. At last came the unloading of the trees, which had been deferred until 8 o’clock in the hope that some ladies who had most largely contributed to their[? ], might be present at the distribution. But in this we were disappointed – the only cloud upon our happy day. The girls each received a new collar, and from two to four handkerchiefs, and a variety of other gifts were distributed, including dolls picture books, toys, bracelets, pictures, pin cuishions, tidys, & etc., & etc. There was also a liberal supply of candies, nuts apples and oranges, a box of sweetmeats having been put into each stocking on Chirstmas Eve, and large cornucopias being placed on the trees for every girl. It was ten o’clock when the branches were at last bare, and all retired to their rooms, after the evening hymn and prayer, tired but happy. The best of order, and kindly feeling throughout the day. For list of donations & donors for Christmas see Donation book. Hard day’s work for all “cleaning up” after the holiday. Omitted to mention that many of the children’s friends visited them yesterday – but too many, alas, with evidences of intoxication about them. © Connecticut State Library. All rights reserved. This piece is excerpted and originally appeared in The Connector, November 2002, Volume 4, Number 4. “Finding Aid to the Long Lane School Inventory of Records, RG 178:002.” Connecticut State Library, 2007. Link. 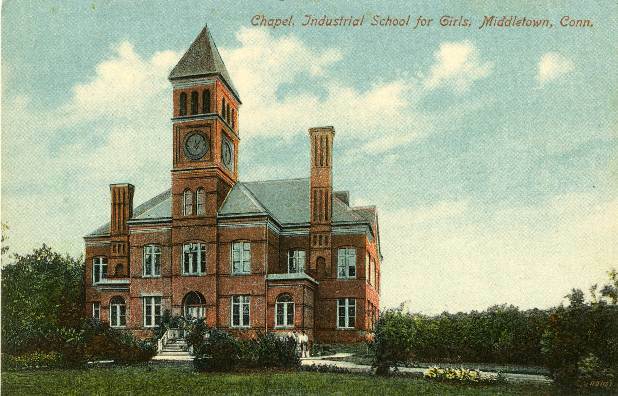 “Pamphlet - Plan and Description of the New School and Chapel Building at the Connecticut Industrial School for Girls - 1884 -1885.” Treasures of Connecticut Libraries, Russell Library, Middletown Room, Ephemera Collection, 2013. Link.